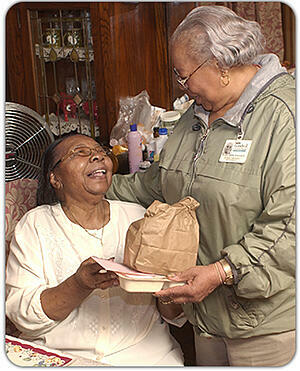 Each day, over 1,300 nutritious meals are delivered to older adults on routes throughout Milwaukee County. This service is essential for older adults who wish to remain in their homes. The program provides both general and therapeutic diets based on a physician’s order. Meals are monitored daily to ensure quality. A person must be at least 60 years or older, or be the spouse of a person at least 60 years or older who receives Meals on Wheels. A person with a disability, regardless of age, who resides in the same house with an eligible person 60 years or older that is receiving Meals on Wheels may also receive meals. The individual must be homebound, i.e. does not leave his or her home under normal circumstances. The person must be unable to participate in the dining center program because of physical or mental impairment or has no other resource to prepare meals. The individual is able to feed him/herself or have someone available to help feed the individual. The individual agrees to be home when meals are delivered, or to notify the program to cancel a meal when absence is unavoidable. To Apply for Services: Contact the Aging Resource Center at (414) 289-6874.